KMRedirect is a tool that share mouse and keyboard of a device to DroidMote Server. The mouse and keyboard can also be transformed in an hardware controller. F1 or F8 - Enable / Disable the Mouse and Keyboard redirect to DroidMote Server. F2 - Enable / Disable Controller mode. CTRL or Middle Mouse Button - Enable / Disable Mouse mode when Controller mode is enabled. The mirroring of an Android device to PC became always better and there are many tools to do this. SCRCPY is open source and work very well via USB3. When you mirror the screen of Android to PC and you want use the Keyboard and Mouse of the PC to play Android games, you can use this tool KMRedirect. 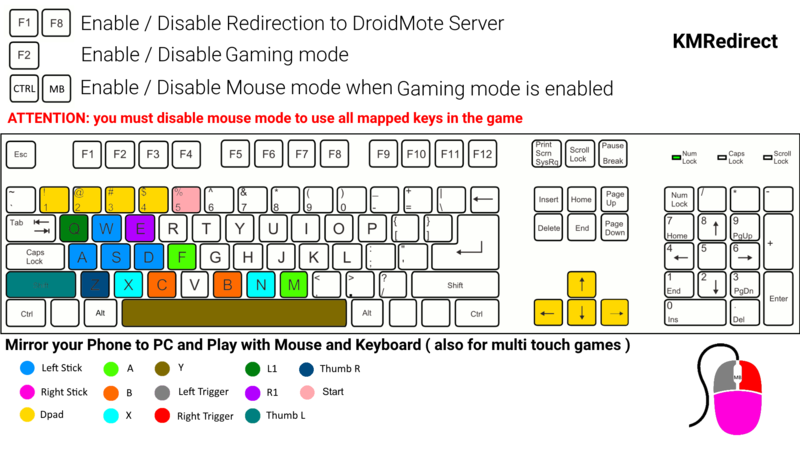 With KMRedirect on your PC, the Keyboard and Mouse can also be trasformed in an hardware controller with the F2 key, in this way, when you have the droidmoteIME enabled on Android ( droidmote client and server on same device with droidmoteIME enabled ), you can play Multi Touch games and games that require a controller with the Mouse and Keyboard of your PC. While you are mirroring with the usb cable, for best performances you can connect KMRedirect to DroidMote Server via adb port forward. adb forward tcp:2302 tcp:2302 and after you can connect to the loopback address 127.0.0.1 of the PC. In this way you will use tcp over usb cable, no wifi or ethernet, all directly with the USB cable. KMRedirect open many useful scenarios also with other OSes. You can share Mouse and Keyboard also between Windows and Linux and the inverse. You can also connect on a single PC via loopback address 127.0.0.1 to transform the mouse and keyboard in an hardware controller.